We all have the power of awesome within us, waiting to be unleashed. We just need to be reminded of that. Stage right, ready to take on the world, and sleep with as many sluts as will have him- while wearing a magnificent suit. Barney is character on the sitcom How I Met Your Mother, played by Neil Patrick Harris. He is also one of the most important pop culture philosophers since The Beatles and Lisa Simpson. Sure he’s a womanizing, self centered jerk who likes girls with daddy issues. But he’s also a good friend, and a man who knows how to suit up and seize life by the balls and shake it. Barney’s shared many nuggets of wisdom over the 5 seasons of the show, but it’s really his enthusiasm and his firm grasp of the power of his own mind as the deciding factor in his destiny that I love. It’s The Secret, in a suit. Using the law of attraction by controlling your thoughts to shape your reality. I’ve long known the power I have over my own mind, and that we choose what our mood will be. We can’t control outside circumstances, just how we react to them. But it’s hard to always practice that. Sometimes we need reminders. In situations like these, it’s helpful to ask WWBD? (What would Barney do?). A few weeks ago, I woke up after a crappy sleep, feeling angry and thinking it was going to be a terrible day. Then, I decided to be awesome instead. And I was, all day- even after 12 hours at work. I think it helped that I suited up when I walked in to work. There is just something powerful about wearing a tie. When it comes to thinking WWBD?, sometimes the specific answers aren’t going to be incredibly helpful in your particular situation. For instance, Barney’s reaction might be to “Suit up!” or to concoct an elaborate scheme to convince a girl that a future version of him has traveled back in time to tell her that she needs to sleep with present Barney so that he might save the world from global warming. That’s ok. As with any role model, you really just need to concentrate on the most important part of their message. So think, WWBD? 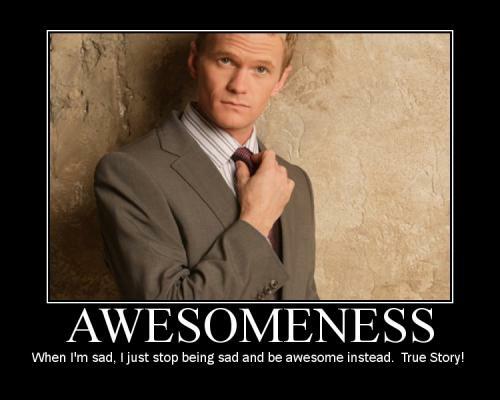 next time you feel sad, then be awesome instead!